In this solo cooking adventure, Gary turns his kitchen into a war zone when he makes a fiery Thai dish. 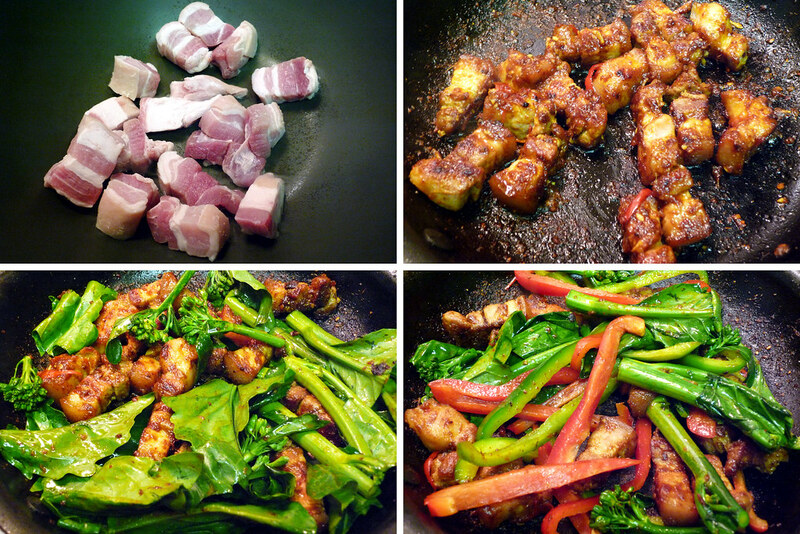 Top left – pork belly in the pan. Top right – pork belly coated with sauce. Bottom left – Chinese broccoli added. Bottom right – peppers added. When I made the braised pork belly, I still had some uncooked pork belly left over. This, of course, had me thinking about things I could do with the remainder of the pork belly. I remembered a Thai dish I’d had some years back that used sliced pork, probably something leaner than pork belly. The cut of pork wasn’t what I remembered most; it was the dry spiciness of the pork and the vegetables in the dish. After doing some research, I discovered the dish I was thinking of was Pad Ped Mu, a spicy pork dish that takes pork, yardlong beans, and Thai bell peppers, coating them with a spicy red curry based sauce. As I worked to adapt existing recipes, I realized that I might not be able to find all the authentic ingredients listed. I’m sure I could find the Thai bell peppers eventually but I wasn’t striving for a complete authentic duplication but rather something that was similar in flavor and spiciness. With that in mind, I sought to make sure the sauce was as authentic as possible and chose to substitute regular bell peppers for their Thai counterparts. When I finally started shopping and discovered that the yardlong beans I was looking at were awful, I decided to substitute Chinese broccoli instead. I had no real logic behind that choice; simply put, I just liked the slightly bitter taste it would add. Top left – pork belly pieces. 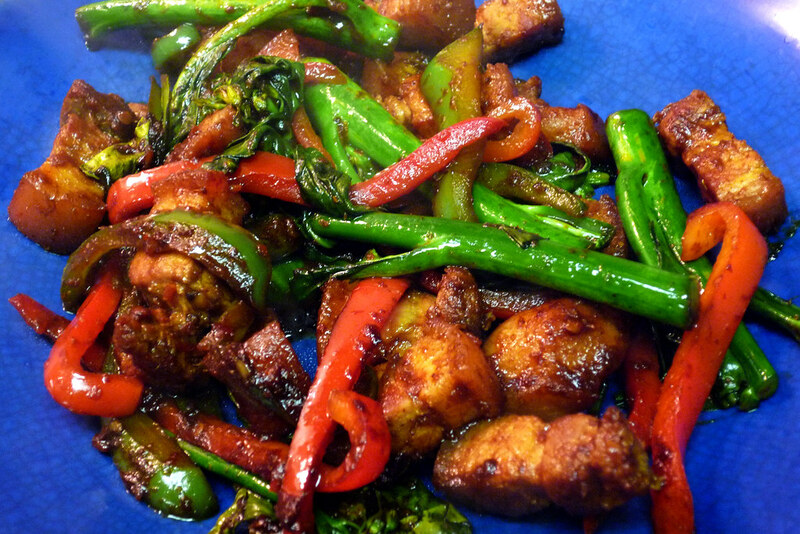 Top right – sliced peppers and chopped Chinese broccoli. 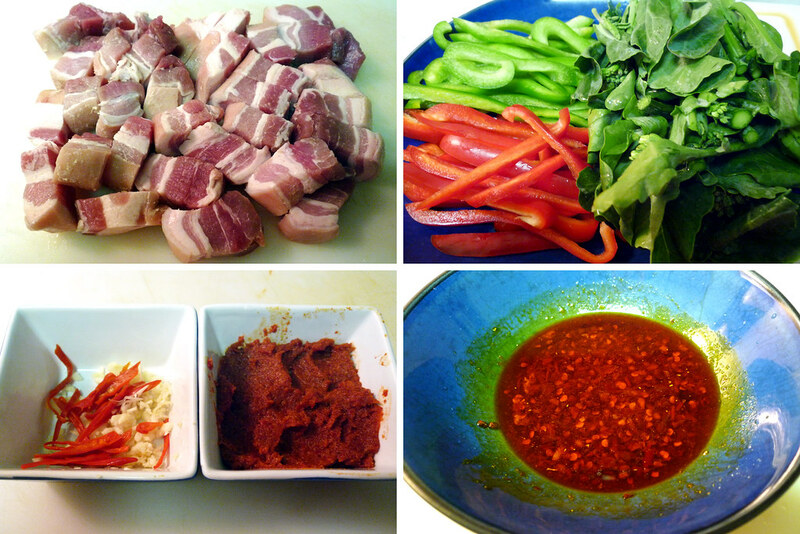 Bottom left – sliced chiles and minced garlic, red curry paste. Bottom right – sauce. Ingredients assembled, vegetables and pork dispatched, and sauces created, it was time to put it all together in the pan. With the heat on my pan as high as I could get it, the pork belly went in first. As it started to brown, the pork released its fat in liquid form and the pan really started to crackle and pop. Then came the curry paste and the chile oil sauce – kids, if you ever make this at home, do NOT forget to crack open the windows in addition to having the fans on your vent on high. Once the curry paste and chile oil hit the pan, it was like a smoke grenade had gone off in my kitchen, a spicy smoke grenade at that. Seriously, I was tearing from all the smoke. Once the smoke dissipated after a few minutes with the windows open, I was able to see what I had been making and it looked wonderful. The pork belly pieces were coated entirely with the curry paste and the high heat had incorporated those flavors into a slight char on the meat’s surface. After that, it was just a simple matter of adding the vegetables and then a little water to help the veggies along (and to liquify the sauce so it coated them as well). Once the vegetables softened and the water evaporated, it was time to take it off the heat. Thai Stir Fried Pork Belly. Once it was done cooking, I plated it up and, along with a bowl of jasmine rice, dinner was ready. Served piping hot, the first bite of pork belly was a very fiery one. Maybe it was helped by my having been in front of the stove for some time cooking it up but I immediately started to sweat from that first bite. It was just the way I wanted my spicy pork to be – very spicy, slightly painful, really tasty. Add the curry paste and stir to combine. Then add the fish sauce, chile oil, garlic, sugar, chiles and pepper, and stir fry for about two minutes, stirring continuously to combine. Add the Chinese broccoli and stir fry until it begins to soften. Add the bell peppers and a few tablespoons of water to help the vegetables soften. Stir to combine. When the water has evaporated, remove from heat and serve. the end result does look damn good though, gonna try something like this soon. Had something similar in Melbourne and it was one of the nicest things Ive ever eaten. Found your recipe and cooked it last night upon my return to Scotland. Didnt quite crisp up the pork enough, but it tasted great. Will be trying again soon. I have cooked this recipe for a number of people and they all love it. Thanks Gary. Looks great. I might add thinly sliced lime leaves..